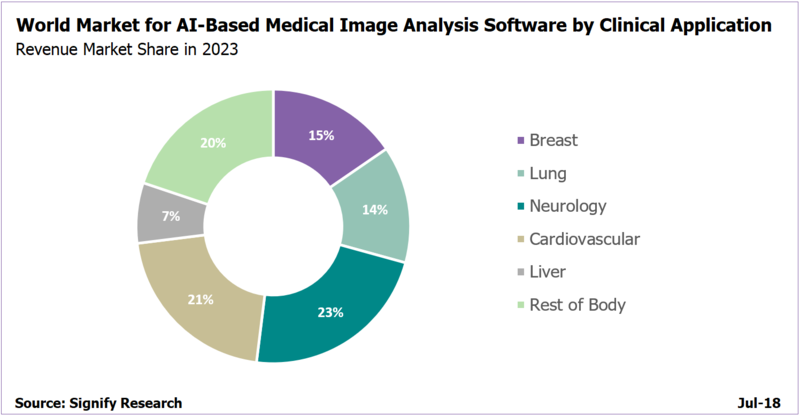 The world market for machine learning in medical imaging, comprising software for automated detection, quantification, decision support and diagnosis, is set for a period of robust growth and is forecast to top $2 billion by 2023, according to a new report from Signify Research, an independent supplier of market intelligence and consultancy to the global healthcare technology industry. Despite some of the earlier market hype, it is becoming increasingly clear that AI will transform the diagnostic imaging industry, both in terms of enhanced productivity, increased diagnostic accuracy, more personalised treatment planning, and ultimately, improved clinical outcomes. AI will play a key role in enabling radiology departments to cope with the ever-increasing volume of diagnostic imaging procedures, despite the chronic shortage of radiologists in many countries. The interest and enthusiasm for AI in the radiologist community has notably increased over the last 12 to 18 months and the discussion has moved on from AI as a threat, to how AI will augment radiologists. At the same time, there are emerging clinical applications where the use of AI has been shown to both improve clinical outcomes and deliver a return on investment for healthcare providers. Examples include software to detect and diagnose stroke and analysis tools to measure blood flow in non-invasive coronary exams. The regulatory process remains challenging and there are few approved and fully commercialised products on the market, particularly deep learning-based products. More large-scale validation studies are needed to show the performance of deep learning algorithms in real-world clinical settings and boost radiologist confidence in AI. The results from AI-based image analysis tools need to be fully integrated into radiologists’ workflows and presented at the time of the primary read. Algorithm developers need to partner with imaging IT vendors to ensure their solutions are tightly integrated. Healthcare providers are reluctant to purchase AI tools from multiple software developers due to the vendor specific integration and implementation challenges and the administrative overhead. Algorithm developers need to establish effective routes to market, such as distribution deals with the established medical imaging vendors and the new breed of vendor-neutral AI platforms. 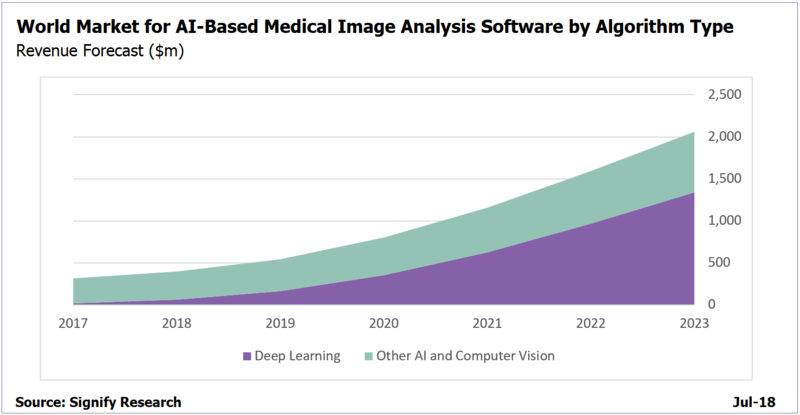 Up to now, the market has mainly been driven by the many start-ups and specialist software developers who are applying machine learning to medical imaging, but the major medical imaging vendors are now ramping-up their AI activities. In the last year or so, we’ve also seen several of the world’s technology giants apply their AI expertise to medical imaging, most notably China’s Tencent and Alibaba. Over the coming years, the combined R&D firepower of the expanding ecosystem will knock down the remaining barriers and radiologists will have a rapidly expanding array of AI-powered workflow and diagnostic tools at their disposal. “Machine Learning in Medical Imaging – 2018 Edition” provides a data-centric and global outlook on the current and projected uptake of machine learning in medical imaging. The report blends primary data collected from in-depth interviews with healthcare professionals and technology vendors, to provide a balanced and objective view of the market. The second edition of the report provides a detailed analysis of the market for detection, quantification, decision support and diagnosis software, with a focus on the clinical applications for these products.